It's officially fall and for some people that means more soup, more pumpkins, more apples, more of lots of things reminiscent of autumn. Yay! I love it when it starts to get chilly outside and I can wear warm, cozy sweaters and corduroy pants. In anticipation of fall I made this potato soup which is sure to warm you right up! 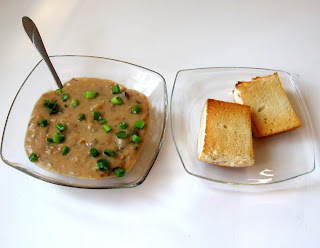 I almost always serve soup with bread of some kind because I love to dip it in the soup. Do you ever do that? For this soup I used a potato medley of purple peruvian, red skinned, and white creamers. It added a little color to the mix. I ended up cooking my soup longer than I state in the directions so it lost some of the brighter colors but there were still there if you look closely, especially the purple. This is a thick soup but there is always the option to add more milk to thin it out to the consistency you want. There are lots of ways to mash the potatoes in the soup: a blender, an immersion blender, a potato masher, even a fork. Be careful not to overmash the potatoes though or they can get gummy and nobody wants gummy potato soup. I do highly recommend the green onions on the top because they add a nice crunch to the finished product. I also used Bacon salt in place of sea salt because I don't eat actual bacon and the salt is vegetarian, it is sold in gourmet stores but it could be in your local grocery store. Feel free to use any salt you like. 1. Preheat oven to 400F. 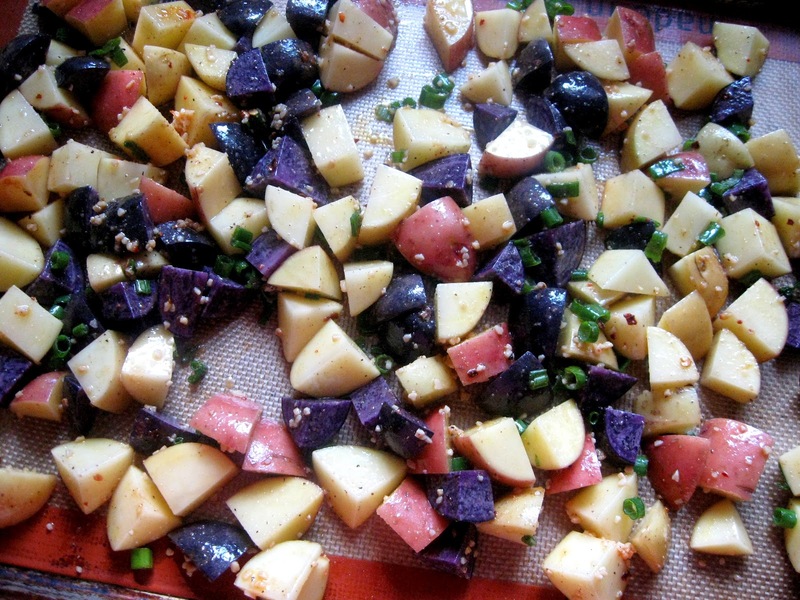 Place the cut potatoes in a mixing bowl and add the garlic, ½ cup green onions, olive oil, bacon salt, ground pepper, and crushed red pepper. Gently stir the potatoes until they are coated well. 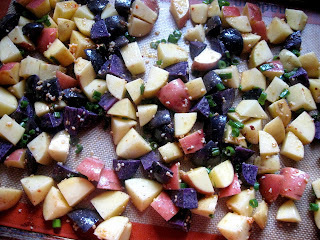 Pour the potatoes onto a sheet pan (line with foil for easy clean-up, I used a Silpat). 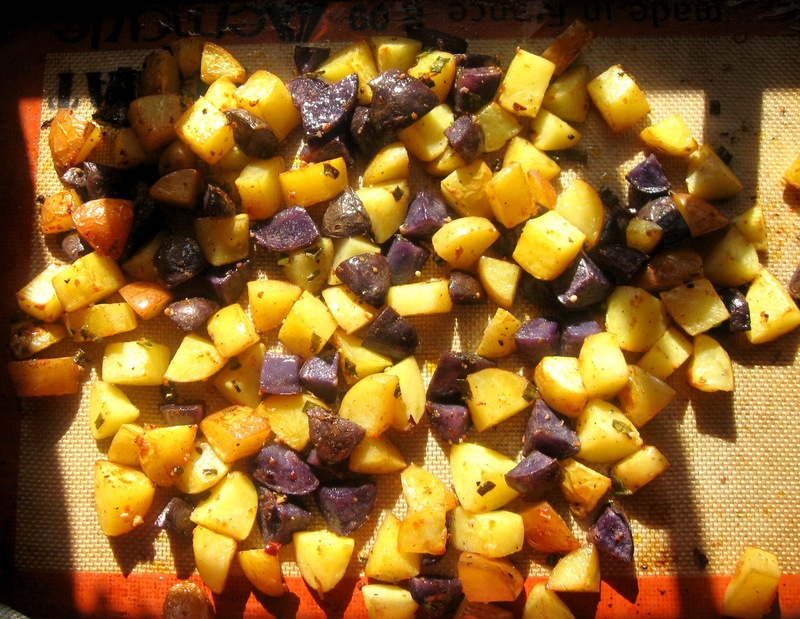 Roast the potatoes for 40 minutes or until a fork can easily be interested into them. Stir two times while they are baking. 2. Remove the potatoes from oven and place them in a large saucepan with the vegetable broth, and the evaporated milk. Stir the mixture to combine. 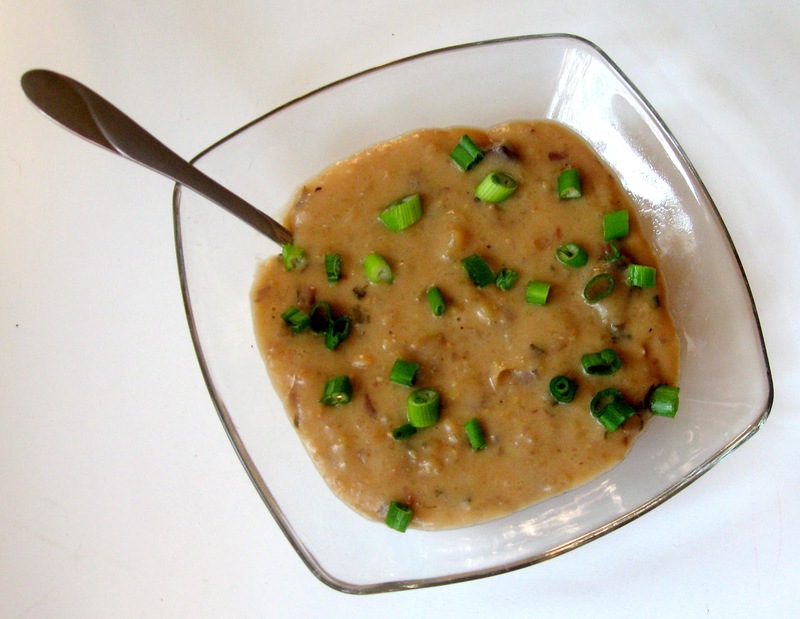 Use an immersion blender and blend the soup while leaving some chunks of potato. Alternately, carefully pour about half of the mixture into a blender and process until smooth, then return to the saucepan. 3. Stir the cheddar cheese into the soup and heat over medium-low until warmed through but not boiled. Stir in enough milk to reach the desired consistency. 4. Before serving, sprinkle with remaining green onions. Mini Spice Cakes and Yay and Yay!